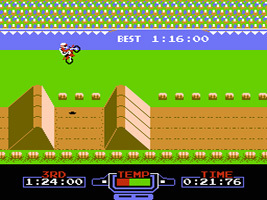 A motocross racing game. Your "Excitebike" has two speeds, Accelerate and Turbo. Using the Turbo causes your temperature gauge to rise. If it overheats, you have to pull over and wait for it to cool. Arrow markers on the track can return your engine to a safe temperature. When you drive over a jump, angle your bike on the way back down so you are level with the ground or you will crash, losing valuable time. Beat the third place time or better to move on to the next race. Race alone or against computer controlled players, or design your own tracks in Edit mode. Try and complete laps of each course, and beating the top three times (the third- and first place times are displayed on screen). Place third or above to move on to the next track. This is the same as Game A, only this time you are not alone. Other Excitebikers ride around the circuit, getting in the way and knocking you off your bike. If you clip their bikes in just the right place you can knock them over without being knocked out yourself. In this mode you can build and save your own circuits. All of the game obstacles are available to choose from, and you can even choose the number of laps (up to 9). In Japan you could save your tracks to the Famicom Tape Deck, but the US "NES Memory Pak" was never released, so the Save and Load options do nothing at all. However, they have been enabled again in later ports and releases.